Spirituality – Pujas.com. God is Real. ▪ Religion is not just one, there are hundreds. ▪ Religion is for those who sleep. ▪ Spirituality is for those who are awake. ▪ Religion is for those who need someone to tell them what to do and want to be guided. ▪ Spirituality is for those who pay attention to their inner voice. ▪ Religion has a set of dogmatic rules. ▪ Spirituality invites us to reason about everything, to question everything. ▪ Religion threatens and frightens. ▪ Spirituality gives inner peace. ▪ Religion speaks of sin and guilt. ▪ Spirituality says, “learn from error”. ▪ Religion represses everything and in some cases it is false. ▪ Spirituality transcends everything, it brings you closer to your truth! ▪ Religion speaks of a god; It is not God. ▪ Spirituality is everything and, therefore, it is in God. ▪ Religion does not tolerate any question. ▪ Religion is human, it is an organization with men’s rules. ▪ Spirituality is Divine, without human rules. ▪ Religion is the cause of divisions. ▪ Religion is looking for you to believe. ▪ Spirituality you have to look for it to believe. ▪ Religion follows the precepts of a sacred book. ▪ Spirituality seeks the sacred in all books. ▪ Religion feeds on fear. ▪ Spirituality feeds on trust and faith. ▪ Religion lives in thought. ▪ Spirituality lives in Consciousness. ▪ Religion deals with doing. ▪ Spirituality has to do with the Self. ▪ Religion feeds the ego. ▪ Spirituality drives to transcend. ▪ Religion makes us renounce the world to follow a god. ▪ Spirituality makes us live in God, without renouncing us. ▪ Religion is a cult. ▪ Religion fills us with dreams of glory in paradise. ▪ Spirituality makes us live the glory and paradise here and now. ▪ Religion lives in the past and in the future. ▪ Spirituality lives in the present. ▪ Religion creates cloisters in our memory. ▪ Spirituality liberates our Consciousness. ▪ Religion makes us believe in eternal life. ▪ Spirituality makes us aware of Eternal Life. ▪ Religion promises life after death. ▪ Spirituality is to find God in our interior during life and death. A while ago, I had an enlightening experience while visiting the Golden Temple, the holiest Sikh shrine. I visit Amritsar often and visit the Temple complex every time. The experience is always rejuvenating. No wonder the city is known as the abode of bliss and blessings. The Golden Temple, conventionally known as Harimander (abode of the Divine) among devotees, was founded on December 28, 1588. Its founder, Guru Arjan Dev, the Sikhs’ Fifth Guru, asked his contemporary, Saint Mian Meer, a Muslim holy man with a large following and a spiritual adviser to the Mogul kingdom, to lay the foundation stone. History tells us that the land for building the town of Amritsar was a gift to Guru Arjan’s mother from Emperor Akbar. Akbar had visited the Sikh Center where he shared a meal with the third Guru of the Sikhs, Guru Amar Das, and gifted the land to the young daughter of the Guru at that time. Further, the Granth’s author invited 34 holy men from different religions to the temple to contribute works to the Guru Granth, the scripture by which the Sikhs live and by which the millions of others feel inspired. By founding the temple, development of the surrounding city, and installation of the holy book in the temple, the Fifth Guru laid the foundation for an interfaith place of pilgrimage for people of all nations of the world. He gave birth to the traditions of a universal spiritual consciousness: the consciousness to overcome the conflict among religions, between heaven and earth, the sacred and the secular, and the human and the Divine. 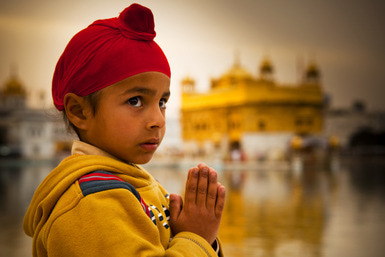 The presence of spiritual understanding in the Golden Temple was meant to pervade the whole humankind. Since its founding, the Temple has been invaded and desecrated three times by Afghan invaders (in 1757, 1762, and 1764). In modern times, it was assaulted by the armed forces of India in 1984. Astonishingly, it has been rebuilt each time with increased grandeur by thousands of devotees from various faiths and nations. Today the holy city of Amritsar enjoys a beauty and harmony that are reminiscent of the Garden of Eden. In the heart of the city, surrounding the Golden Temple, is “the spring of the water of life,” bright as crystal and producing ripples that seem to flow through the hearts of everyone who visits here. From the Golden Temple (so called because it is covered with gold) where the sacred Guru Granth scripture is read continuously, there emanate constant vibrations for the healing of people and their hearts – people of all races, colors, and dispositions. The singing of spiritual hymns in classical ragas (musical tunes from the ancient Indian subcontinent) is central to Sikh worship; the sounds of this singing around the clock are a spiritual feast for visitors. Even those who do not understand the language describe the experience as emotionally and spiritually uplifting. When you hear this, you know that the clergy of the Sikh religion have surrendered any claims of exclusivity at the feet of the Divine. On one occasion, I visited the Golden Temple as a guide for a group of interfaith delegates.They were followers of six different world religions, and came from nine different countries. They had come to participate in the International Conference on the Guru Granth, which was held in Amritsar at the Guru Nanak Dev University to deliberate the Sikh scripture’s interfaith wisdom. The conference was being held at a time when the need for faith, wisdom, love, and compassion was felt greater than ever before. People were hungry for a vision and liberating truth, the participants felt, and our world desperately needed healing and renewal. The scholars at the conference affirmed that, in this generation, the fundamental task of religious and educational leadership would be to discover “the spring of the water of life” and to help make it flow through the middle of our villages, towns, and cities. I felt that all of us were called to make it flow so that all people might be equitably nourished, and that the whole community life be purified and sustained. Building spiritual societies locally and a faith civilization globally will be aided by making “this water of life” flow through each of our own hearts and each of our communities. The hymns being sung in the Temple stressed the universal wisdom of world faiths. We stopped and prayed there for peace within and without. We prayed for the higher understanding of the faith through which each one of us would experience divinity and avow spiritual consciousness. A review of the history of the Golden Temple and the compilation of the Scripture residing in it taught us that, among religions, there were shared values and a universal foundation. They were of greater significance than the differences that historically divide people and the religions they follow. Emeritus Professor and Chairman, Dept of Pharmacology & Neuroscience, University of North Texas Health Science Center. Emeritus, Guru Nanak Dev University, Amritsar, India. President, Academy of Guru Granth Studies. Do I have to choose between Science and Religion? Science, religion, and culture are three forces that greatly affect our world. It is no exaggeration to say that the course of human history will depend on the relationship between these disciplines, and the impact and influence each area has on society. Intellectuals, for example, will be attracted to religions that are mainly dynamic, progressive, and at peace with science. Science has succeeded remarkably in learning about the workings of the human brain and the earth and universe around us. It is unlocking the code of life by mapping human DNA, tracing the history of the known universe, and disclosing virtually all physical and biological phenomena in impressive detail. And until recently, science and religion co-mingled well in Sikh society. Sikh clergy simply ignored science, as their educational handicaps did not permit the implications. To read the full article, please visit my website. This link will take you to my website, where you can read the full article. Author adminPosted on May 7, 2016 May 8, 2016 Categories Does God Exist?, Seeking God, Sikhism, SpiritualityTags god, religion, science, science and religion and godLeave a comment on Do I have to choose between Science and Religion? How is Spirituality different from a Religion?